Do you know that Halloween is associated with the Celtic festival of Samhain or "Summer's End" celebrated in Ireland and Scotland during medieval times? The festival marked the ending of the harvest season and beginning of winter or the "dark season". And, people believed that during the Samhain, the underworld door is opened and spirits and ghosts enter into our world. People would dress up in costumes in honor of the departed souls. With the Irish and Scottish immigrants the Halloween came to the US. Make your child travel the time and come to appreciate the roots from where we all have sprung up. PartyBell has some splendid costumes for the kids that makes them feel one with the yore. The 17th and 18th century rewrote the world as it was known. From the science to the country borders, everything was redefined and in a way, the foundation for the world as it is known today was laid. The costume includes hat, pants and vest with attached sleeves and jabot. 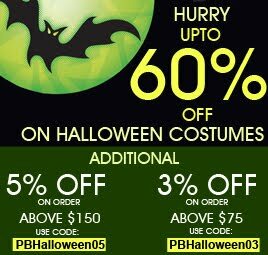 Take advantage of the PartyBell Halloween special discount. 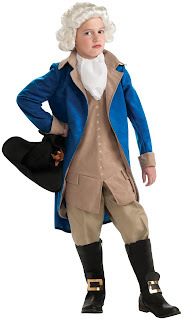 The costume includes tailcoat, hat and pants. Let's not forget our national heroes! The Commander-in-Chief of the Continental Army during the American Revolutionary War, one of the founding fathers of the United States and the most revered figure in our history. It would be an honor for anyone to role-play him. The costume includes vest-front with attached shirt, coat, pants and the iconic hat. Complete the look by adding the wig. The national hero who alerted his countrymen about the British movement has earned our respect over the years. The costume (available on PartyBell) includes shirt front and vest front, pants with attached boot tops and hat. A distinguished statesman and one of the founding fathers of our country. Respect! The costume includes jacket with attached vest and jabot. Complete the look with an accessory kit. It is available on PartyBell on a discounted price. For the pretty girls, the lovely Statue of Liberty costume. The costume is available on PartyBell. What better way to end the blogpost than with our favorite Abraham Lincoln! The costume is includes hat, beard and jacket. It is available on PartyBell on a discounted price. Make your children pay homage to the most revered personalities in our history.